C'mon and celebrate and have a good time! 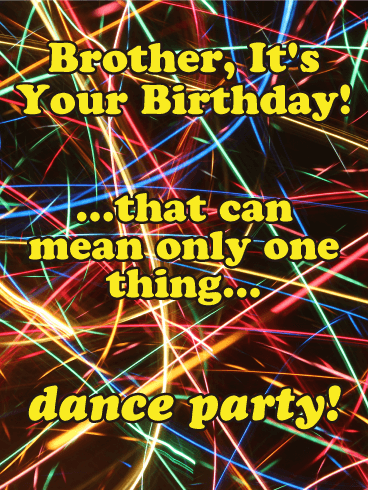 It's your brother's birthday and this dance party birthday card is all the rave. Literally. Send a groovy birthday greeting card to your brother today. 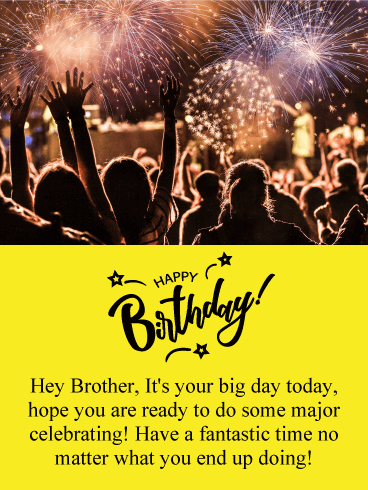 Get the party started when you send this super cool birthday card and fun message to your awesome brother. Does your brother dance to his own beat? This energetic birthday card is for him! Brother, It's Your Birthday! ...that can mean only one thing...dance party! Wish your brother a day is filled with good friends, joy, and fun! It's what everyone would want on their big day! This fantastic birthday card features creative candles lit with illuminating bulbs, very creative! It will make him feel special that you took the time to send such a great birthday card his way. 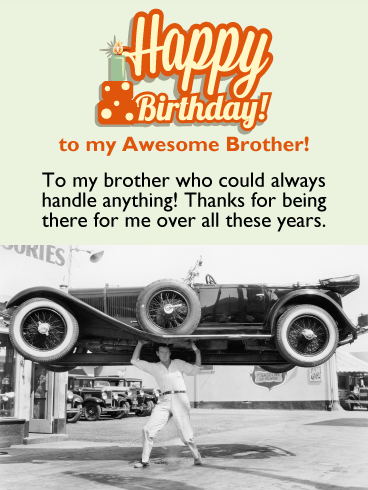 So let your brother know how awesome he is today by sending this birthday card over to him without delay! Send birthday wishes your brother's way and an image of a wonderful gift box. It will have him looking forward to the presents he will be receiving on this very special day. This birthday card also sends wishes of happiness, success, and everything else your brother is wishing for. So send this brilliant birthday card your brother's way to ensure he has a fantastic day! He will thank you for it! Want to send your brother a birthday card that gets straight to the point? Then this greeting card will do the trick. It features large lettering that spells, "Happy Birthday To You". He can't miss it! It's the perfect birthday card to get him excited about his big day, and also let him know that you love him! Make sure to get this birthday card out to him right away, to let him know you care! Remind your brother that his birthday is a big occasion, worthy of a huge celebration! This awesome birthday card features fireworks bursting in the sky above a group of party goers. Looks like a lot of fun! The Happy Birthday lettering matches the mood of this greeting card and the bright yellow background gives it a festive look! 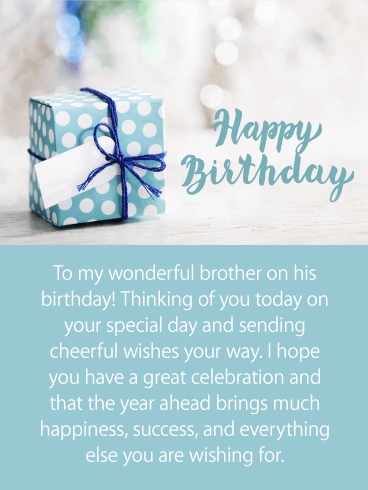 Let your brother know you are thinking of him and wishing him a fantastic time by sending this exciting birthday card out soon! Some brothers like to watch out for, take care of, and protect their siblings. 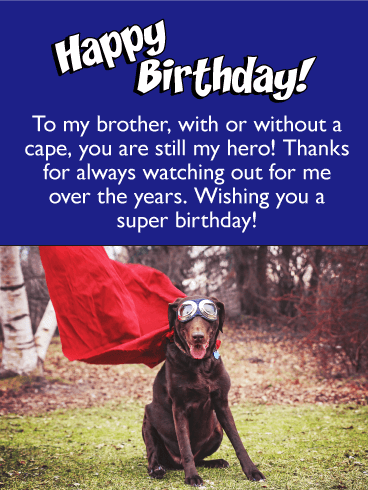 If you have a brother like this, then let him know how much it means to you with this awesome birthday card! It shows a man appearing to be holding up a car, so the message that reads, "To my brother who could always handle anything! ", is very fitting. 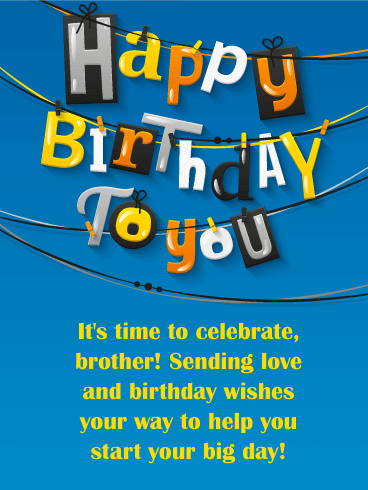 Wish your brother a happy birthday with this greeting card that will make him feel great on his birthday! A vintage car at sunset, an image your brother would love, especially if he admires classic cars. This beautiful birthday card will get your brother's special day off to a wonderful start. He will enjoy reading that he has been your source of inspiration and happiness over the years. 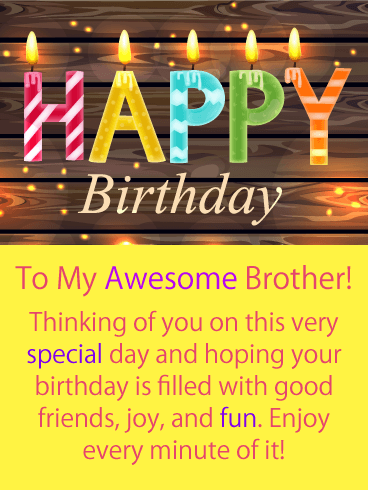 So wish your brother a happy birthday and let him know how much you appreciate him on this very special day. We raise a glass to awesome brothers everywhere. 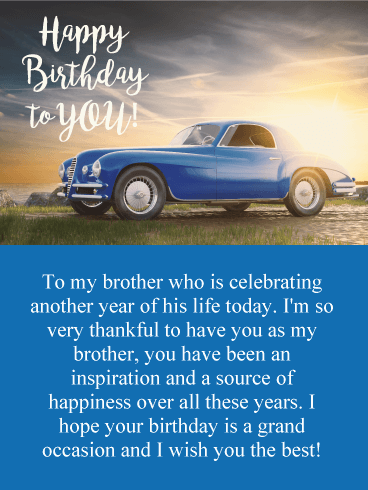 Inspire your brother on his birthday this year with a great birthday greeting card. 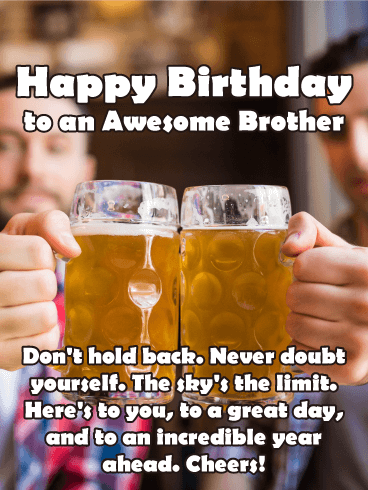 This beer birthday card will get your brother pumped for an incredible year ahead. 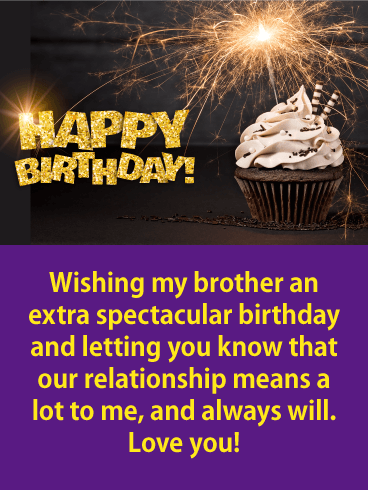 Celebrate your brother's birthday with a fun birthday greeting card and send today! It's easy and fast to wish a very happy birthday to your amazing brother with our one-of-a-kind greeting cards. 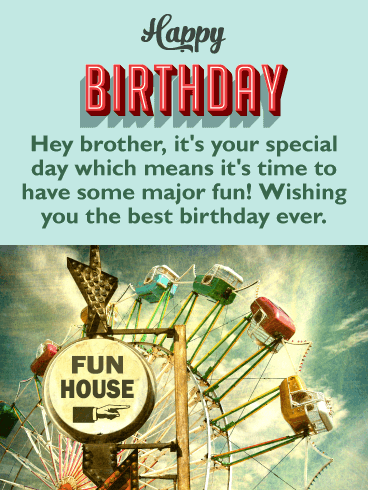 Send your brother a unique and fun birthday card this year that features a vintage carnival ride! This colorful retro style image might even bring back some fond memories for him. So wish your brother some major fun and the best birthday ever by getting this great greeting card over to him for his special day! He will thank you for sending him such a special birthday card! 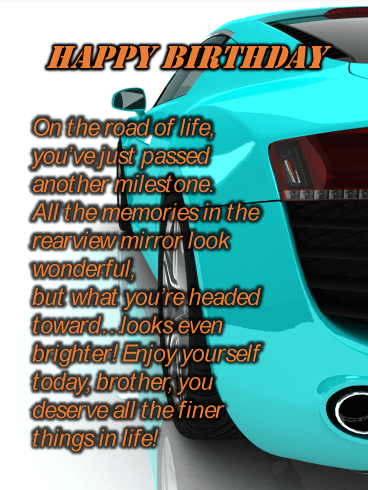 Wish your terrific brother a happy birthday with this festive and meaningful birthday card. It's bursting with birthday icons such a decorative cake, presents, streamers, and confetti, and will certainly add some excitement to his special day! 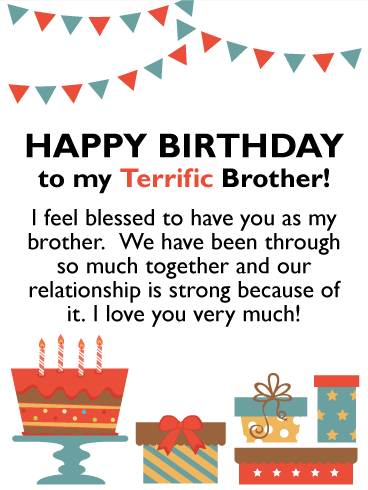 This wonderful birthday card communicates to him that you feel blessed to have him as your brother and that you feel the two of you have a strong relationship. Your brother couldn't ask for a more special birthday message!